Rush will be inducted into the Rock And Roll Hall Of Fame this spring by Dave Grohl and Taylor Hawkins of the Foo Fighters. The Rock Hall has announced the initial list of presenters for the event, which will honor this year’s inductees: Heart, Albert King, Randy Newman, Public Enemy, Rush and Donna Summer; as well as Lou Adler and Quincy Jones, this year’s recipients of the Ahmet Ertegun Award for Lifetime Achievement. Special guests at the 28th Annual Rock and Roll Hall of Fame Induction are set to include John Mayer and Gary Clark Jr., who will perform for King, with Mayer giving the induction speech; 1998 Rock and Roll Hall of Fame inductee Don Henley, who will induct Newman; and Christina Aguilera and Jennifer Hudson, who will perform in honor of Summer. More details about performances, additional presenters and special guests will be announced at a later date. Advance tickets for American Express Cardmembers will be available from Thursday, January 24 at 10 a.m. PST through Sunday, January 27 at 10 p.m. PST. Tickets can be purchased via http://www.ticketmaster.com. Preferred seating presales for members of the Rock and Roll Hall of Fame and Museum, as well as members of the Heart and Rush official fan clubs, will begin on Monday, January 28 at 10 a.m. PST through Thursday, January 31 at 10 p.m. PST at http://www.ticketmaster.com. The public on-sale will begin on Friday, February 1 at 10 a.m. PST. To purchase tickets, visit http://www.ticketmaster.com or charge-by-phone at 1-800-745-3000. There will be a four-ticket limit on all orders. Additionally, three levels of VIP packages will be available through Ticketmaster. The 28th Annual Rock and Rock Hall of Fame Induction Ceremony will be held at Nokia Theatre L.A. LIVE in Los Angeles on Thursday, April 18, 2013. 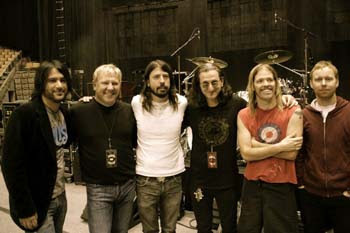 Rush’s Geddy Lee and Alex Lifeson made a rare guest appearance with the Foo Fighters during the band’s March 22, 2008 show at Toronto’s Air Canada Centre. The pairing performed the classic Rush instrumental, “YYZ”, named after the code for the city’s Pearson International Airport. Check out the video below!